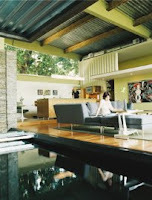 The image to the left is an interior shot of a home designed by a visionary architect named Jennifer Siegel . The home Ms. Siegel designed here first came to my attention in Dwell magazine and I was reminded of her ideas when I was thinking about sustainability this morning. Sustainability is the new buzzword of the design and architect worlds, and it's a steaming locomotive on its way to you. I've written for the last couple of days about wasteful practices and their unsustainability over the long term. I think the current housing market mess and mortgage industry debacle are a another symptom of this unsustainability. Housing prices have increased dramatically in the last 20 years. Increased to the point where typical wage earners can no longer afford to buy a home in a desireable part of the country. The market reaction to that unaffordability was to get creative on the financing end of it and the results are splashed across the headlines every morning. Everyone seems hell-bent on fixing the problem by bailing people out of bad mortgages on homes they can't afford. The blame seems to have settled exclusively on the mortgage industry. Oh, there's plenty of blame there, but it's not the whole story. Building costs have soared and it's not due to greed on the part of the building industry either. Concrete really does cost a lot more now than it used to. Ditto lumber and finishes and labor and all the rest. What people consider to be an adequate and appropriate home has reached the point of unsustainability, just like their water use has. It's time, high time, to look at what constitutes a house. At current rates of population growth, the US will need an additional 427 billion square feet of space by the year 2030. That's a lot of room for a lot of people, most of whom cannot afford to spend $300,000 on a stucco split level on a cul de sac. So what's there to do? The house above is made from discarded shipping containers. The unintended consequence of our trade imbalance with China is that every day, ships laden with goods arrive in US ports and get unloaded. Because we buy so much more than we sell to them, for most of those containers, it's a one-way trip. So they pile up in New York and LA and Miami and Tampa and San Francisco and New Orleans and they sit there. A growing group of visionaries is looking to them to solve two sustainability problems at once. How do you build interesting, affordable housing that will allow builders to make enough money that they will build it and what the hell are we going to do with that mountain of shipping containers along the expressway. The answer is build houses. Interesting, beautiful, sustainable houses that people can afford. There is an entire web subculture out there on the topic and two places where I've been reading up on this are a blog called Treehugger (http://www.treehugger.com/files/2005/01/shipping_contai.php) and an architectural clearinghouse called Fabprefab (http://www.fabprefab.com/fabfiles/containerbayhome.htm). It is not 1945 anymore and it's time to stop looking at housing and commercial construction as if it were.